Remembrance Day (also known as Armistice Day) has been observed in Commonwealth countries since the end of World War I to remember the members of the armed forces who have died in the line of duty. Remembrance Day is observed on November 11th to recall the end of hostilities of World War I on that date in 1918. Hostilities formally ended “at the 11th hour of the 11th day of the 11th month,” in accordance with the Armistice, signed by representatives of Germany and the Entente between 5:12 and 5:20 that morning. (“At the 11th hour” refers to the passing of the 11th hour, or 11:00 am.) World War I officially ended with the signing of the Treaty of Versailles on June 28, 1919. The day was specifically dedicated by King George V as a day of remembrance for members of the armed forces who were killed during World War I. The first official Armistice Day was subsequently held on the grounds of Buckingham Palace on the morning of November 11, 1919. The following are some of the memorials dedicated by soldiers to their companions in war. A British soldier cradles his wounded horse at the 58th Division Memorial, Chipilly, Somme battlefields. Photo courtesy greatwar.co.uk. The monument at Chipilly by French sculptor Henri Désiré Gauquié (1858-1927) is dedicated to those who died while fighting with the 58th (London) Division including during the Battle of Amiens in August 1918. 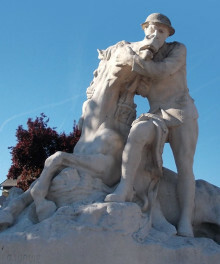 This divisional memorial depicts an artilleryman cradling the head of his wounded war horse. The inclusion of the horse pays tribute to the millions of horses who served alongside the military in the 1914–1918 war. Many thousands died while in service with military forces on all sides. Tamworth Memorial to the Australian Light Horse (known locally as the Waler Memorial). Photo New South Wales War Memorials. 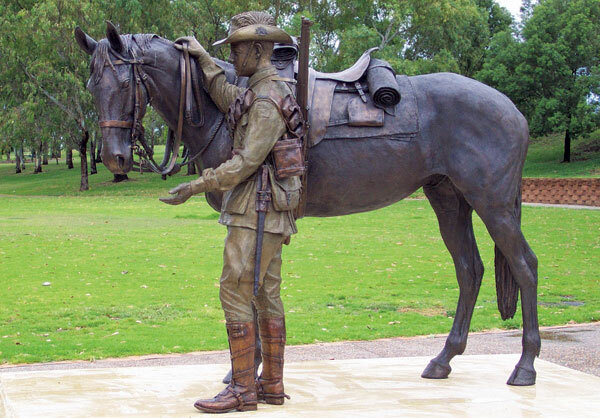 The community of Tamworth, with some Federal and State assistance, raised $190,000 over a period of some five years, to erect a memorial dedicated to all horses that died in war. 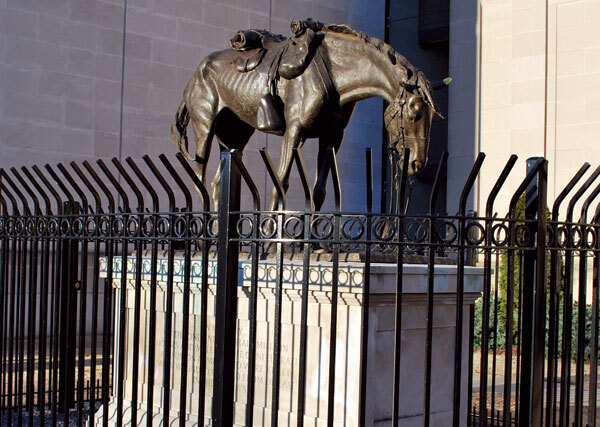 Newcastle sculptor Tanya Bartlett was commissioned to create the horse (traditionally the Waler breed) and trooper in bronze, with the four large bronze plaques telling of the exploits of the Light Horse during the First World War. Just one horse returned to Australia from the war. The memorial was unveiled by Major General W.B. Digger James AC MBE MC on October 29, 2009. Tamworth is recognized as the National Equine Capital of Australia. The War Horse at the Virginia Historical Society, Richmond, Va. 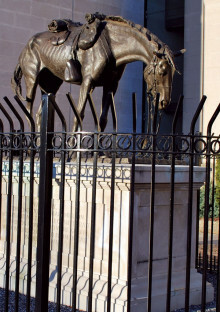 The bronze horse sculpture is mounted on a six-foot base and surrounded by a high iron fence. Photo Virginia Historical Society. The War Horse is a memorial to the Civil War horse, designed by sculptor Tessa Pullan of Rutland, England, and given to the historical society by Paul Mellon. The sculpture was dedicated September 17, 1997. An inscription on the granite reads: In memory of the one and one half million horses and mules of the Confederate and Union armies who were killed, were wounded or died from disease in the Civil War. 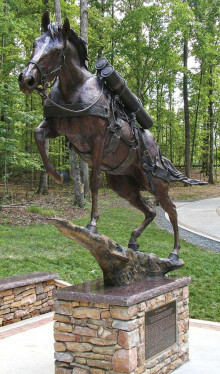 The statue of Staff Sergeant Reckless, Marine Corp, by sculptor Jocelyn Russell shows the mare carrying ammunition shells and other combat equipment. It was unveiled July 26, 2013, in Semper Fidelis Memorial Park at the National Museum of the Marine Corps in Virginia. There is a lock of her tail hair in the base of the statue. Photo courtesy United States Marine Corp.
Staff Sergeant Reckless was a mare purchased at the Seoul Racetrack in October 1952 by members of the United States Marine Corps and trained to be a pack horse for the Recoilless Rifle Platoon, Anti-Tank Company, 5th Marine Regiment, 1st Marine Division. Reckless quickly became the camp mascot, and she served in numerous combat actions during the Korean War, carrying supplies and ammunition, and was also used to evacuate wounded. Learning each supply route after only a couple of trips, she often travelled to deliver supplies to the troops on her own, without benefit of a handler. The highlight of her nine-month military career came in March 1953 during fighting around Vegas Hill when, in a single day, she made 51 solo trips to resupply multiple front line units. She was wounded in combat twice, given the battlefield rank of corporal in 1953, and then a battlefield promotion to sergeant in 1954, several months after the war ended. She also became the first horse in the Marine Corps known to have participated in an amphibious landing. The Marines brought her home, and Reckless retired in 1960 at Camp Pendleton, where the mare was promoted to staff sergeant by the commandant of the Marine Corps. Reckless is the U.S. military’s most decorated animal, having earned two Purple Hearts, a Good Conduct Medal, Presidential Unit Citation with star, National Defense Service Medal, Korean Service Medal, United Nations Service Medal, and Republic of Korea Presidential Unit Citation, all of which she wore on her scarlet-and-gold blanket. She died of natural causes in 1968 and was buried with full military honours with a bronze plaque on her grave at the Camp Pendleton stables. 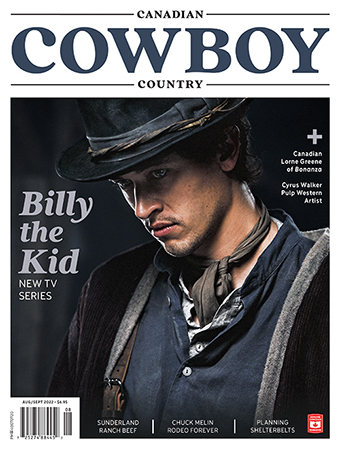 Sticks to his guns”. Photo Shrine of Remembrance, Melbourne. Located on St. Kilda Road in Melbourne, A Tribute to Our War Horses was originally unveiled in 1926, and was later moved to its present position near the Shrine of Remembrance. 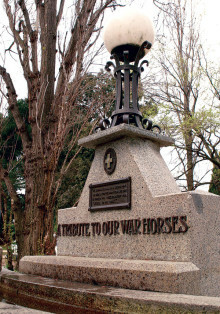 The granite horse trough was erected by the Purple Cross Society, an organisation of women concerned with the welfare of horses during WWI, using funds raised by Boer War Light Horsemen. An estimated 958,000 horses and mules were killed in WWI; over 169,000 left Australia and never returned. One of the most famous was a horse called David who served in the 107 Battery Regiment during the Boer War from 1899-1902, and then as a gun wheel in France. He was awarded many Army medals and honours including the Queen’s Medal, the King’s Medal and Star with bar. 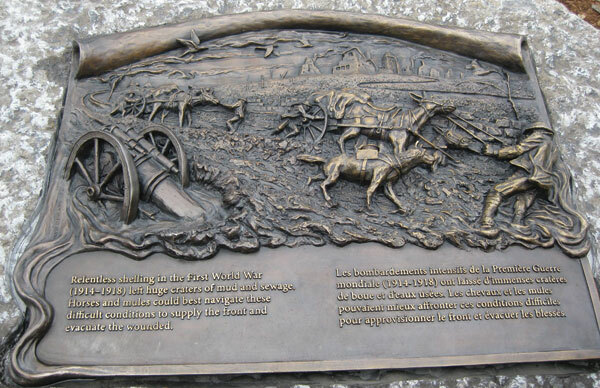 Animals in War – Dedication to Horses plaque. Photo by Shalindhi Perera. 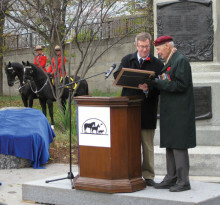 With mounted RCMP in red serge in the background, Ottawa Mayor Jim Watson hands over the Animals in War Proclamation to AIW leader Lloyd Swick, standing in front of the Boer War Monument. Photo by Shalindhi Perera. The Animals in War Memorial, (officially Animals in War and Les animaux en temps de guerre) is located in Confederation Park in Ottawa to commemorate animals used by the Canadian military (Canadian Army) in conflicts since the Second Boer War. The Animals in War Dedication features a life-size war dog and three bas-relief plaques on three boulders; one dedicated to dogs, one to mules and one to horses. Harper as honorary patron of the project. The memorial was unveiled on November 3, 2012. Western section of London’s Animals in War Memorial located in Hyde Park. Photo courtesy The Animals in War Memorial Fund. Northern section of the memorial. Photo courtesy The Animals in War Memorial Fund. Located in Hyde Park, London, the Animals in War Memorial was designed by English sculptor David Backhouse to commemorate the countless animals that have served and died under British military command throughout history. It was unveiled in November 2004 by Princess Anne, the Princess Royal. The memorial features a 55 ft by 58 ft (16.8 m by 17.7 m) curved Portland stone wall: the symbolic arena of war, emblazoned with images of various struggling animals, along with two heavily-laden bronze mules progressing up the stairs of the monument, and a bronze horse and bronze dog beyond it looking into the distance.